This month, Kosher Connection is making desserts for Passover (Pesach). I had planned to do this way before the holiday but had no time. Here the deadline is due and my kitchen is not ready for Pesach but I have packed away all my baking and cooking wares. My dilemma was how do I make this work. For those of you who don't prepare and celebrate this holiday, I am not sure, if you can understand the complexity of changing over one's kitchen. We literally pack up or shut down everything from the year and bring in different items, which we store from Pesach to Pesach. I am fortunate, having an extra buffet that a relative gave us and I store myself there and do not go into that piece for the entire time between the annual holiday. I have already cleared out the cabinets, I will be using, and filled them with my Pesach pots and pans and gadgets, flatware, dishes, etc. I purchased new spices and they are in place. I got lots of potato starch and cocoa and sugar. All this is stored in the cabinets..
Matzah is in place in anticipation of the week of no chametz (anything from the five grains plus). I kind of like not eating bread and pasta. It is a break and I appreciate more after the 8 days. Back to my dessert. Since hubby has celiac, I bake with potato starch, the entire year but for Passover , we do not eat rice or beans which means no rice flour. 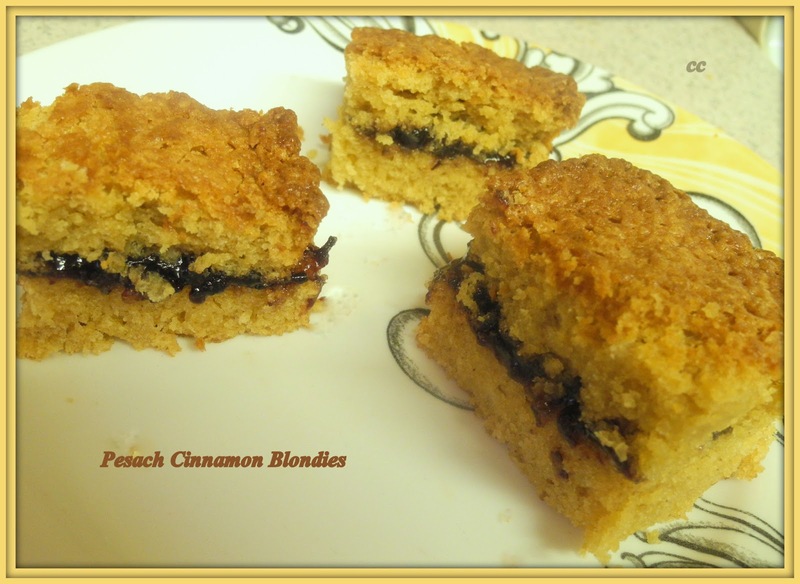 There is one recipe that always works and that is the Pesach blondies, not very fancy but absolutely the yummiest. To make it a little more festive, I filled them with Pesachdik black cherry jam and added a teaspoon of cinnamon to the batter. It worked. If you are baking for Pesach, I highly recommend this as well as the Pesach brownies which, in my humble opinion are better than those, during the year. I plan to post that recipe, as well, in the near-future. Preheat the oven to 350 degrees and grease 2 small rectangular pans. It is better to use a 9 x 13 but I had none, at the time. Mix the sugars and oil and then add in the other ingredients, mixing until everything is incorporated. Pour half of the batterinto the pan and cover it with a thin coating of jam. If you like it thicker, by all means, double the amount and use that. Bake for about 35 - 45 minutes or until a sharp knife comes out clean. If you make these before Pesach, wrap and freeze for the holiday. Love the filling in between cinnamon blondies. Yum! This is a nice explanation for those of us not familiar with the cooking practices for the holiday. Personally the recipes sound good to me. We're having a party at Tumbleweed Contessa - What'd You Do This Weekend? Not a flavor profile I would ever have thought to combine. Certainly food for thought! What kind of oil do you use? Have you ever made these with olive oil? Looks simple and easy. Nice stuff to have around for a nosh. I really never cared much for desserts using matzoh meal, so I like how it's not an ingredient in your blondies. I have always admired all the hard work that has to be done before and after Passover. It certainly does require a lot of organizing and dedication. These blondies sound really delicious, Chaya. I love the black cherry filling.